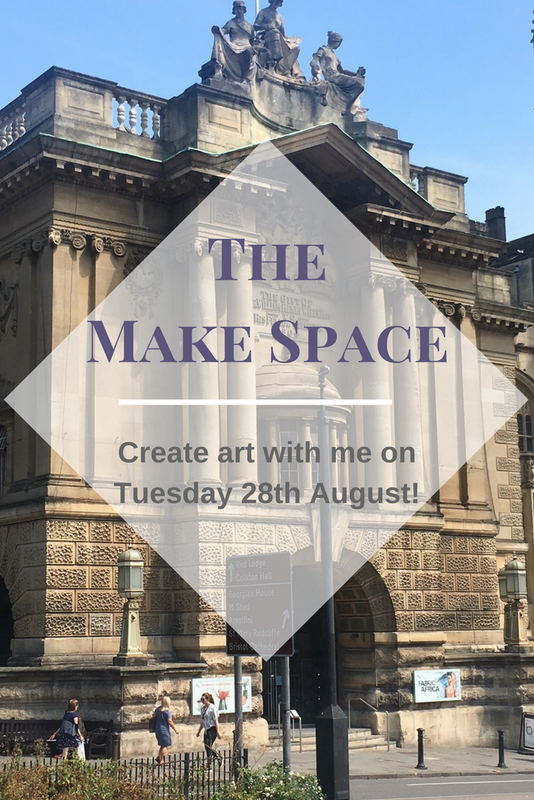 Earlier this year, my good friend, Claire, sent me a link to some information about using the Make Space at Bristol Museum and Art Galleries. The Make Space was running alongside the Woman's Hour Craft Prize exhibition, on tour from the V&A, and would be a chance for local artisans and crafters to share their work and skills with the public. Claire is always full of good ideas when I get creatively stuck. I looked over the information from the museum and then put it to the back of mind. A couple of weeks later, I decided to send an email to the coordinator to get an application pack and then, when that came through, I shelved the idea again. I make wedding accessories so if I were to offer a workshop, would it really appeal to enough people? It took me a while to get my ideas together for the application. To be honest, I think I massively overthought it but my inner critic was playing up and pushing me towards perfectionism when I just needed something to put on paper. And then it hit me. This wasn't about the workshop alone. In fact, there was no obligation to run one. This was about the creative process. While I'd been focusing on my target audience, I'd forgotten how fascinating it can be to watch artisans and creatives work. That's what this was all about and I could certainly do something to show that. So I pitched two ideas on my application. One was a workshop for people to book into, the other was a simple, free activity that people could dip in to if they wanted on the day. Weighing it all up and chatting about the options with the coordinator of the project, Karen, I decided to go with the second option. So here's the plan: come along and make a small beaded flower using wire, pearls, beads and Swarovski crystals. Use any colours I have available and whichever beads take your fancy on the day. The Woman's Hour Craft Prize celebrates outstanding artists who have made a significant contribution to craft practice over the last 5 years. I saw this as an opportunity to embrace our creativity and encourage collaboration. I wanted to celebrate the diversity of the people of Bristol, so this is a chance to make your mark on a design, by choosing beads and colours that you feel represent you. You're going to be helping me build a hair piece or a piece of jewellery...I will decide once I've seen how many flowers we create! You leave your flower in a little bowl and, after the event, I will transform all your little flowers in to something wearable, which will then be available to purchase. I've decided to donate 50% of the sale of the piece to Action for Children. Action for Children supported us through our adoption journey and still support us now, 18 months down the line. Action for children provide support for young people whose families need support, who can no longer live with birth families, who are disabled and who are in great need. Parenting a child with a traumatic past is challenging to say the least and we, as adoptive parents, are incredibly grateful that we've had the support of the charity to help us build our forever family. So come along and make your mark on something special on Tuesday 28th August, 10:30am -5pm. Or wait until the piece is ready to buy and donate to a good cause...either way, I'd love for you to get involved! I'll also have some of my hair pieces on display in the Make Space for you to purchase. For each piece sold on the day, I'll make a 10% donation to the Museum as a thank you for letting me use their space. You can try them on, place orders, book workshops and ask me any questions you may have - I'll be happy to help. You can find out about all the activities taking place in the Make Space, along with information about the Woman's Hour Craft Prize touring exhibition here.